By Audrey Golden. Mar 29, 2017. 9:00 AM. Have you seen the literary engravings of Lars Bo? While you may not be familiar with Lars Bo’s name, we’re willing to bet that you’ve seen his work in some of your favorite books. Bo was a Danish artist who was born on May 29, 1924 and lived until October 21, 1999. He studied design in Denmark until 1943, and later traveled through Europe before moving to Paris, where he would remain until his death. During his early years in Paris, Bo wrote a novel entitled The Wonderful House in Paris [Det vidunderlige hus i Paris]. Yet most literary enthusiasts aren’t familiar with Bo because of his writing. Rather, Bo has become known for his marvelous illustrations and aquatints, which provided illustrations for a number of works of twentieth-century literature. According to an article in The Paris Review, the artist preferred to think of his engravings as “illuminations . . . in the tradition of the medieval Books of Hours". What were some of the first books that Lars Bo illustrated? 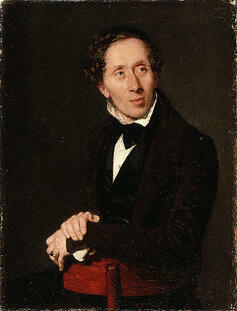 He became known for the illustrations he provided for some of Hans Christian Andersen’s short stories and fairy tales. For instance, Bo created the illustrations for a Danish printing of The Snow Queen. An Adventure Into Seven Stories [Snedronningen. Et eventyr i syv historier.] (1967). This particular edition was published by Carlsen in Copenhagen, with 70 pages containing colored etchings by Lars Bo. If you’re thinking of adding to your collection of illustrated books or starting a collection of books with etchings, you should be able to find a first edition of this text for a relatively reasonable price. Given that Bo was a Danish artist, his work was sought after for collections of Andersen’s stories, which were popular in both Denmark and across Western Europe throughout the twentieth century. For example, Carlsen Verlag also published a German-language edition of Hans Christian Andersen’s The Traveling Companion [Der Wandergefährte] (1983), which also featured colored engraving illustrations for the story. The book contains 44 pages, and like the edition of The Snow Queen we mentioned above, you should also be able to add a copy of this book to your collection for a relatively reasonable price. In addition to providing the art for numerous Hans Christian Andersen stories, Bo also created engravings for a number of other writers’ books, as well as some collectible art portfolios. When the article in The Paris Review came out in 1961, it lauded Bo’s Nine Etchings (1960), which were hand-selected by the artist from a larger collection of illustrations for Kafka’s short fiction. This particular edition was published by Gyldendal out of Copenhagen, and it was published in a limited run. Nearly all books of engravings completed by Bo, the article highlights, were printed only in small runs of between one hundred and two hundred copies. As such, his works are highly collectible. In addition to engraving pieces for Kafka writings, Bo also illustrated works by William Blake, Paul Valéry, Victor Hugo, Molière, and Nathaniel Hawthorne, among others. Some of his original etchings are now owned by libraries and museums across the globe, from the New York Public Library to the Musee d’Art Moderne in Paris. If you already have a collection of illustrated books or are seeking new additions to an already thriving collection, we recommend exploring some of the texts containing Lars Bo illustrations that we’ve mentioned here. And if you’re interested in specific publishers, some of the best-known publishers of Bo’s work include La Guilde de la Gravure and Georges Lambert in Paris, and Delphic Arts of New York. Given that Bo lived in Paris for most of his adult life and was favored by Parisian publishers in particular, you might even want to schedule a trip to some of your favorite French bookstores. Read the full Paris Review article here.